An instance of the built-in SharedArrayBuffer constructor. This API is experimental and may change significantly. Definition at line 4336 of file v8.h. Definition at line 9363 of file v8.h. Make this SharedArrayBuffer external. The pointer to underlying memory block and byte length are returned as |Contents| structure. After SharedArrayBuffer had been externalized, it does no longer own the memory block. The caller should take steps to free memory when it is no longer needed. The memory block is guaranteed to be allocated with |Allocator::Allocate| by the allocator specified in v8::Isolate::CreateParams::array_buffer_allocator. Get a pointer to the ArrayBuffer's underlying memory block without externalizing it. If the ArrayBuffer is not externalized, this pointer will become invalid as soon as the ArrayBuffer became garbage collected. The embedder should make sure to hold a strong reference to the ArrayBuffer while accessing this pointer. Returns true if SharedArrayBuffer is externalized, that is, does not own its memory block. Create a new SharedArrayBuffer. Allocate |byte_length| bytes. Allocated memory will be owned by a created SharedArrayBuffer and will be deallocated when it is garbage-collected, unless the object is externalized. Create a new SharedArrayBuffer over an existing memory block. 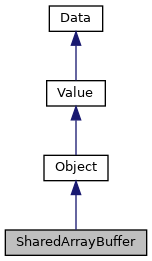 The created array buffer is immediately in externalized state unless otherwise specified. The memory block will not be reclaimed when a created SharedArrayBuffer is garbage-collected. Definition at line 4423 of file v8.h.